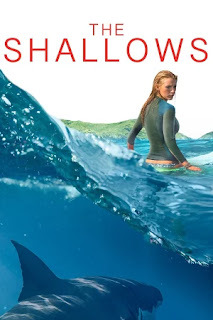 The Shallows, like most harrowing tales of survival, reinforces the idea that I would simply die almost immediately when confronted with a similar situation. But unlike me, Nancy (Blake Lively) is a med school dropout who knows how to use makeshift tools to treat wounds. She is also adventurous enough to know the ins and outs of the particular area she’s stranded in, and thusly, the ways in which it presents dangers and advantages against her inevitable attacker. To be sure, you’d have to be someone like Nancy to find yourself in this sort of situation in the first place, but then again I shouldn’t feel too bad, most people would have died very quickly in this situation. But Nancy isn’t most people. That’s why this film is about her, and not me. This shark attack thriller begins like most, with a beach vacation in paradise. An outdoorsy, sports loving, thrill seeker, left alone to pursue a passion that may just be the end of her. In fact it rarely strays from some common tropes of the genre. It’s a combination of Jaws and Cast Away, complete with Jaws’s feud between man and beast, and Cast Away’s lone survivor forced to treat their own wounds, eat things they’re not accustomed to, and enjoy the company of a silent friend - who happens to be covered in their blood. The silent friend here is an injured seagull incapable of flying away. They share space on a relatively flat rock sticking high enough out of the water to serve as refuge from the shark infested water. But I’m getting ahead of myself. The early scenes involve flashbacks and phone conversations with her father and sister to fill in Nancy’s backstory. She is visiting this secluded Mexican beach because it was her mother’s favorite vacation destination. The recent passing of her mother has caused Nancy to reevaluate her life. Why go to med school and become a doctor if even doctors can’t save the ones you love? But like her mother, Nancy is presented with a survival situation in which she has to choose to fight for her life or succumb. The shark then becomes a literal representation of the unseen force that killed her mother. This brief, subtle, but effective character arc serves to elevate what would be an otherwise generic shark attack B movie. Make no mistake it is a B movie that knows quite well what it is, and it goes all out. That usually means equal measures of fun excitement and painfully unrealistic moments. I know relatively little about sharks, but The Shallows is a convincing case that writer Anthony Jaswinski and director Jaume Collet-Serra know even less. Or they’re frequently willing to stretch the truth beyond our suspension of disbelief in order to suit their purposes. Neither make for a compelling case to see this film. However, Flavio Martínez Labiano’s cinematography is often quite eye catching and Blake Lively’s performance carries this solo film throughout. Unlike most films of this nature, she never forgets that she’s injured, even if I often doubted she’d have the strength or energy to do what she does after so many painful and malnourished hours. But as often as the film relied on a smart audience to pick up on the visual storytelling that communicated Nancy’s inner thought processes, Collet-Serra and Jaswinski opt for spelling it out with needless speaking out loud to herself. The predatory shark that has her stranded is an enormous Great White Shark whose size is equivalent to that of other over-sized movie sharks. Yet this one might be the most agile movie shark to date. It jumps out of the water to bite at food in hard to reach places, it even skillfully body bumps objects attempting to knock its prey off. This shark goes after Nancy with such vengeance you’d think it holds her personally responsible for all the cruel things mankind has done to animals. At just 86 minutes it’s hard to say The Shallows overstays its welcome, but it very nearly does. It has just enough thrills to keep audiences in their seat, but it becomes a series of frustrating events that tried my patience at every turn. The CGI is often subpar, and the inconsistent tone leaves a lot to be desired. It opens like a serious drama, but becomes an absurd, over-the-top action thriller by the end. Yet I must hand it to her, Blake Lively excels in both the physical action and the finer emotional moments. It’s an excellent performance far better than this movie deserved.